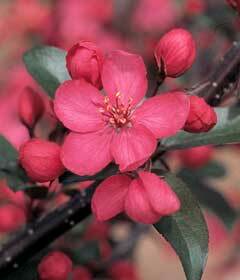 It’s hard to go wrong with a crabapple tree if you’re looking for small, low-maintenance and attractive most of the year. This easy to grow landscape tree is well suited to small yards, growing just 15-20 feet high with a 12-16 foot spread. It is characterized by diminutive fruit and richly colored leaves, blossoms and fruit. The only maintenance involves removing suckers and branches that cross or rub against each other. Here a few of its benefits. From stark winter silhouettes come deeply lobed, purple leaves that keep their color all summer. On their heels, delicate buds opening into tiny magenta-pink blossoms bedeck the tree with grace. Then come the royal raindrops – tiny maroon-red crabapples that take on a dramatic orange-red color by fall. How tiny? Just ¼ inch in diameter! The good news is that if you do make jelly, the fruit’s high pectin content means you don’t have to add any of the store bought variety. The quest of early apple planting in America wasn’t to obtain an apple for eating, but rather an apple for drinking – cider, that is. It led to a massive but totally random hybridization effort in which Johnny Appleseed was surely involved. It resulted in many permutations of ‘wild apples.’ These included trees that produced varying degrees of bitter, acrid fruit they called ‘spitters.’ That didn’t stop our forefathers who soon discovered that various fermented combinations of crabs and sweeter apples resulted in a most satisfactory beverage. There are some you won’t hear complaining about this ‘crabby’ tree. Its blossoms are especially attractive to bees and other pollinators. Crabapples cling to the tree into early winter when freezing temperatures make the fruit mushy. 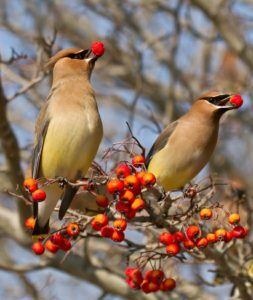 They’re a big draw for birds; in particular, the cedar waxwing.